Wood continues its reign as a preferred decking material for many homeowners. Its natural appearance makes wood an attractive choice -- however, sun, rain and mold can cause discoloration and graying. Some folks enjoy the rustic, weathered look while others prefer a deck that looks fresh and vibrant. Restoring a neglected, weathered deck requires deep cleaning and brightening. After restoring a gray deck, keep up with regular maintenance to ensure that it will not turn gray again. Keep deck boards looking fresh. Spray the deck with oxygen bleach deck cleaner. Scrub the deck with a long-handled deck scrubbing brush. Rinse the deck with a high-pressure washer. Wash in the direction of the wood grain, holding the nozzle 10 inches from the deck's surface and moving it in a sweeping motion. Apply deck brightener to the deck using a mop or a paint roller. Use a paintbrush for narrow areas. Rinse the deck brightener with the high-pressure washer. Leave the deck to dry for 2 to 3 days. Paint the deck with deck water seal. Clear or tinted deck water seals are available. Use a paintbrush for narrow areas and a paint pad with a long handle for broad surfaces. Paint in the direction of the wood grain. Wash the deck periodically, scrubbing it with oxygen bleach cleaner and rinsing with fresh water. Refinish the deck every 2 to 3 years by painting it with a new coat of deck water seal, as in the previous step. Keep the deck swept of wet debris such as leaves to prevent discoloration. An awning or a patio cover will provide shade over the deck, preventing sun damage. Use only biodegradable products to prevent environmental damage. 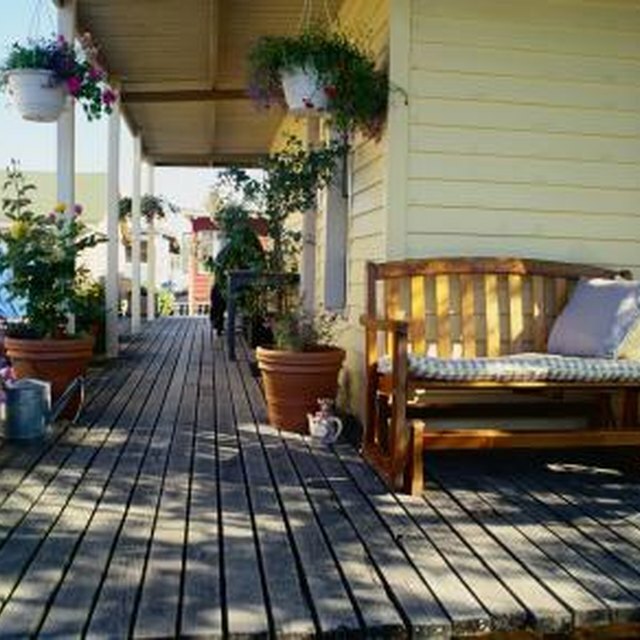 OPW Decks: 101 Wood Deck Restoration Tips!